Dangerous Democrats Part Three -- a New Star is Born, page 4 enis extensions. Anyone who sees ANYTHING wrong with what these kids are doing has, themselves, got an "agenda". For all those who think this kid is the enemy,.. how many of you have been victim to school shootings. I would like to think surely someone should have the same perspective before passing judgement. You do not have to be a party to a particular situation to have a valid opinion of it. If that where not the case we would all need to stop participating in conversations such as these. Most of us have not been president or won any kind of political office; many of us have not been to war; or are transgender ... and the vast vast majority of us will not be victims of mass shootings. This does not in itself disqualify our opinions on the subjects. You are correct that you don't have to have experienced an event to have an (likely innacurate) opinion of it, but make no mistake, your opinion is a lot less valid than someone who has suffered through it. I don't have anything against the kid personally, but my neighbor does. The first time he saw Hogg on TV he said "That's the face of fascism" Then he stated to rub his tattoo. I thought it was just nonsense, but after seeing Hogg on the TV today, I'm beginning to see what he saw. I didn't talk to my neighbor yet, but I'm sure he's going to be going off about this for a while. Hopefully though he's wrong, and Hogg will either grow up or go away. My neighbor is a nice guy, survived a concentration camp during WW2, but doesn't hold grudges. Man though Hogg really upset him, this kids either being used to push a narrative, or just doesn't get it. Either way my neighbor says that the more exposure that kid gets the worse it's going to be for everyone. Again I just hope he's wrong. Please! People! You see a teen on TV and he is the face of fascism? No wonder you are all so afraid. With such a sensitivity to the media you could be swept away with the slightest breeze. Clutch your guns. They will save you from this teenage-tyranny. It's funny how the left and right are so quick to fear their political opponents as the next fascist monster ready to gobble the rest of us up. Trump is the next Hitler; Hogg is the next Hitler; oh my dog just farted maybe she's the next Hitler? And then those very same people try to explain why using "Your the next Hitler" as an attack on their view point is just hyperbole; not realizing their own hyperbaly. In this particular case it may be that a hallmark of Fascism is to round up the kids, indoctrinate them and then get them to rat out their parents and promote a political agenda. It isn't fear, btw. Although I find it funny when a liberal always brings up "fear" when faced with an idea that is different. They do that because that's how THEY feel about any idea that is different. It isn't fear when I point out that the left is currently using children to promote a political agenda that is, quite frankly, anti-constitutional. Anti-American. A political styling that is fascist. By definition, historically. I am just pointing out what it actually is. Hey your right. I was trying to give the idea that Hogg and Trump are the next Hitler the benefit of the doubt by assuming it comes from a place of fear of ones political opponents... but it very well could be that it comes from a place of stupidity rather than fear. I'll take your word for it you have no fear involved when you seem to be pointing out that all politically opinions expressed by a youthful group must automatically be suspected because "hey there where some young nazi" ... that's just plain stupid. I will assume by your post that you have some cognitive dysfunction and did not understand that I was merely pointing out that it is not "fear" or "emotion" that drives someone when they just point out that what is happening to our children in America right now with the March of Soros is EXACTLY the same thing that Hitler did with the Hitler Youth. You calling me stupid was kinda funny though... I will take it as a compliment. kinda of like conjuring up the idea that Soros has the ear of every young person out there who are just dying to turn in their parents. Just curious if you had heard the Kraft family chartered a jet to fly a bunch of students from broward county to DC, out of the goodness of their hearts I am guessing? Who else is footing the bill for that thing, Bloomberg, Soros, CNN, MSNBC? Follow the money and you find the agenda that is being pushed... outside of the Kraft family I do not know anyone else that is picking up the tab for certain so where is the money coming from. Problem with Hogg is if you get him off script he falls back on insults and cursing, which tells me he is reading a script prepared for him. IF he was able to think on his feet and continue a conversation in a healthy manner even after it drifts I would be much more inclined to give him a chance. Think the GOP is saying "ok, WTF do we do now" ??? Judging by our normal voter turnout maybe 10% of those kids will vote when old enough, so not really a problem yet. You are correct that you don't have to have experienced an event to have an (likely innacurate) opinion of it, but make no mistake, your opinion is a lot less valid than someone who has suffer through it. That is not correct at all. There are a meriod of inputs that makes one opinion more or less valid on a subject. Participation can be one of them, but it could also be a hindrance as well. For example a person who has studied viloninet crime for an adult life time will likely have a much more valid (accurate) opinion on the subject than last night's mugging victim. The victim may be able to offer a prospective that others might not be able to, but it is also likely that it will be clouded by the emotion of the incident and can be full of innacuicies. For all those who think this kid is the enemy,.. how many of you have been victim to a school shooting? I would like to think surely someone should have the same perspective before passing judgement. It does in no way make them the authority on guns or our rights, emotion does not equal knowledge. I havent been a victim of a school shooting, but I have been in active combat much of my life and shot at more times than I can count. I currently have a fragment from an AK round still in my leg. Why am I not anti-gun? Your statement doesnt even make sense. 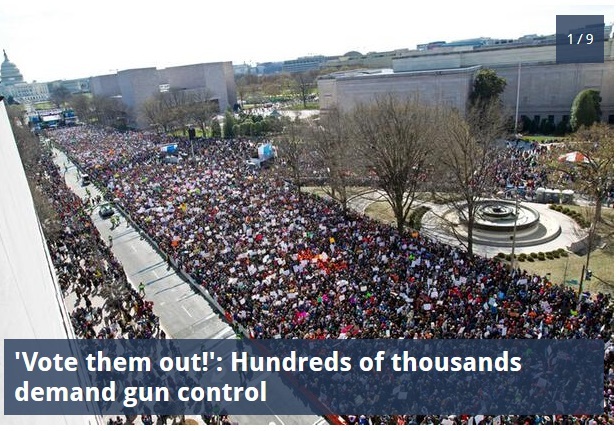 No, true conservatives are saying "Wow look how many people are so ill informed and ignorant"
olaru12 posted a picture of a protest... when you can place all of those people on a Kraft family chartered jet then we can start dismissing them all as Kraft agenda pushers ... which I'm guessing is to sell less guns and more cheese? The midterms in November will be interesting. Those kids have parents. A sleeping giant has awakened, and they're pissed. Now Trump has caused a bigly disaffection among some of his most ardent conservative supporters with his vote on the budget.